Busy weekends in Napa Valley can easily choke popular Route 29, leaving you trapped in non-moving frustration. The Silverado Trail is usually a good alternative, but its high speed limit doesn't allow for a proper look around. 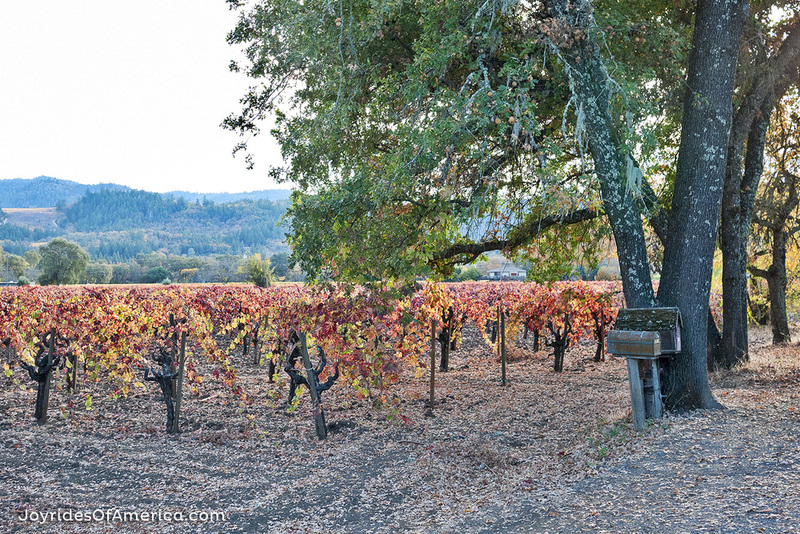 If you want to avoid the traffic and have room to breath, head to Calistoga, where there are plenty of quiet back lanes for slowing down and absorbing the beauty of this vineyard valley. At the top of Napa Valley, these back roads are almost always reliably yours, and yours alone. Here's a rundown of my favorite back lanes at any hour, any day of the week, for bicycles, motorcycles, or cars...even RVs. 1 mile, flat vineyards : a popular cycling and walking loop across the street from Solage Resort and Spa. I especially love the plot of gnarly old vines on Pickett Road and the mountainous backdrop. • Taste the wine at: B Cellars, Lava Vine. • Eat at: Solbar (at the Solage Resort). 4 miles, flat vineyards : at the base of Mt. St. Helena, Tubbs Lane is a popular shortcut for commuters, while Bennett Lane is quiet and offers room to stop and pull over. There's a beautiful old olive tree on the long stretch of Bennett Lane that invites a shady stop on a a hot summer day. Go slow and watch for local walkers and dogs on the road. It's also a favorite cycling loop for tourists. • Taste the wine at: Chateau Montelena, Bennett Lane Winery, Summers Estate Winery and Envy Wines. • Eat at: The taco truck behind Mitchell's Drive-In corner store, for delicious Mexican food that's easy on your wallet. 8.5 miles, mountain climb : Completed in 1868, this was the original toll road over Mt. St Helena from Calistoga to Middletown. It is twisty, narrow and precarious at times, with occasional views of the rocky palisades above and the valley below. NOT RECOMMENDED FOR ANY RVs or LARGE VEHICLES. • Taste the wine at: Jericho Canyon Vineyard - a beautiful place to stop and experience gorgeous terraced vineyards and exceptional Cabernet. 1 mile, flat vineyards, residential : this back road includes one of the original picturesque stone bridges, built in 1904. Historic 1904 bridge on Greenwood Ave.
1.5 miles, flat vineyards, residential : from Calistoga, take this shady residential back road to Bennett Lane and avoid the busy traffic of the Silverado Trail and Route 29. 1 mile, flat vineyards : One of the popular cross streets up valley, Dunaweal Lane is laden with vineyards and popular wineries, so expect a car or two. For a more congenial stop, say hello to watercolor artist Barbara Nechis who is often working in her vineyard studio and invites visitors. • Taste the wine at: Clos Pegase, Twomey and Sterling Vineyards. (local secret) A one-mile stretch of the Napa Valley Vine Trail has been completed here and follows the old Southern Pacific rail line. Hop on this paved, level trail at Dunaweal Lane, across from Sterling Vineyards for a stress-free ride into Calistoga. The trail is for walkers and cyclists only. 1.25 miles, flat vineyards : Another popular up valley cross street, Larkmead Lane is home to Frank Family Vineyards and Larkmead Vineyards. The eastern half is lined with young olive trees and in the springtime California poppies brighten the edge of the road. At it's intersection with Route 29, is the entrance to Bothe Napa Valley State Park. • Taste the wine at: Frank Family Vineyards and Larkmead Vineyards. Heading north out of town on Route 29, start the ascent of Mt. St Helena to the second pull-off for an excellent aerial view of Calistoga. Get there early enough in the morning to watch the hot air balloons launch. NOT RECOMMENDED FOR LARGE RVs.